Are you a fan of the SCP Foundation? Since I can't make Polls (I need to have a Premium Membership for that and I don't want one) I'm just going to write Journal Entries instead. > What's the SCP Foundation? Write your answers down in the comments section below. Have you ever heard of the SCP Foundation? Also, I feel the same way! 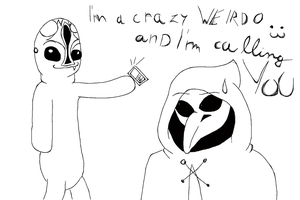 SCP-173's my favorite! Me two! I always love originals!!! Oh, YOU'RE amazonparrot975 I remember you! Hi! Great, except the fact that I always keep getting cyberbullied on YouTube and the fact that my turtle died. Oh well. Is that a Kind of? Are you a fan of the SCP Foundation?Since I can't make Polls (I need to have a Premium Membership for that and I don't want one) I'm just going to write Journal Entries instead.